We are almost one month down in 2015. How are all of your new year resolutions going for you? What goals and resolutions did you make this year? Almost everyone I know personally has at least one healthy related resolution which includes exercising more, eating healthier, cutting out soda and dropping 20 or more pounds. Do any of these resolutions sound like some of yours? I use to be that person who would set a goal to weigh less by the following new year. I would also wish it on my birthday to weigh less the next year. Up to 2012 those resolutions and wishes never came true. As of matter of fact as each year went by, I would be heavier, not lighter. Did this only happen to me? Can anyone else relate? Late winter/early spring of 2012 I set out to live a healthier lifestyle. I did not set a specific goal or resolution, I just told myself that I will walk off my weight and be healthier by eating not so healthy foods. So from 2012 through today I'm down 100 pounds. I've learned to not have a set number but to continue, day by day to get stronger and healthier. It feels good to be in the 3rd week of January and not have any broken resolutions. Have you stuck with yours or did you break some? Did you know that after one week, 75% of people have broken their resolutions. This is because resolutions are set, most seem realistic but they aren't if a plan isn't created to keep accountable for actions to reach the set resolutions. If cutting back calories, even 20% less in every day eating is a goal or a resolution it can be done with a plan. The plan is a lifestyle change that allows you to still be serious about your goals but to remember that you still have to live and enjoy life. With this in mind, Brancott Estate was the first to plant and create the world's first Marlborough Sauvignon Blanc wine with 20% lower in calories without changing the taste or quality. This product has since changed the course of our country's wine industry. 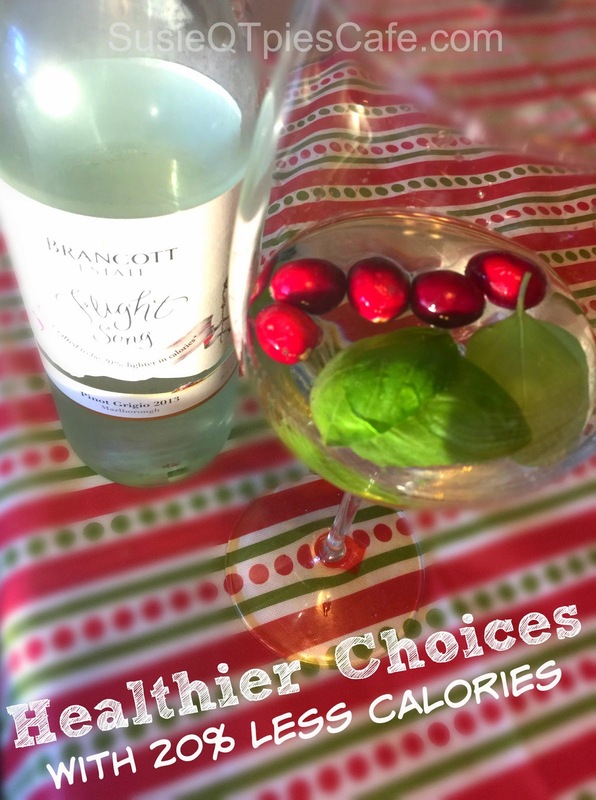 By doing this, the Brancott Estate Flight Song wine will allow you to keep your healthy resolutions and have fun doing it! Would you be willing to try a wine that has 20% less calories than similar selections of Sauvignon Blanc and Pinot Grigio? I was skeptical that a company could create a pleasant wine by cutting out the calories. I do not like to over indulge and drink my calories but for special occasions it is acceptable and especially at a 20% less calorie savings! I took on the challenge and participate in this product sampling of the Brancott Estate Flight Song wines. I have to say that I was most impressed with the Sauvignon Blanc and Pinot Grigio wines. I knew that they were less calorie but did not tell anyone at our Christmas Day meal. Guess what? No one noticed and everyone liked the wine. It was so refreshing to have a glass of wine or two without the guilt. I love adding fruit to my wine and had the extra options for my guest. We had blueberries, pomegranates, strawberries, cranberries, mint, basil, and blackberries which could all be added to the glasses of wine. This is perfect for a dinner, night time "wine" down, and even with pre dinner appetizers. Can you see yourself trying out the Flight Song wines? If you like wine this is a great one to try and will help you keep within your calorie goal for the day. Even if you do indulge, know that you are saving 20% in calories.